No sooner have I gotten back to our hotel in Sukhumvit for my Thailand Sojourn Part 2 adventures, it was time for me to go back to school. Thai culinary school that is. 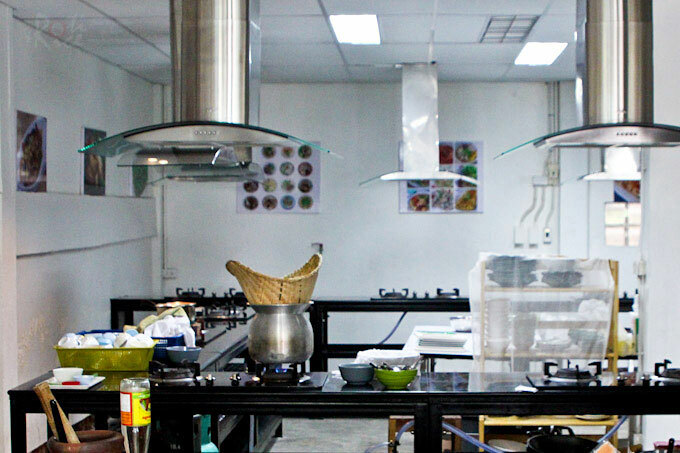 😉 I had booked a session with Bangkok Thai Cooking Academy at Bang Chak, just 5 stations away on the Skytrain from our hotel and I was very much looking forward to it. The instructor Air, met me at the station. I was asked to pick 4 main dishes and 1 dessert from a menu for the cooking class. I chose Gaeng Panang Gai (Panang Curry with Chicken), Tord Man Pla (Thai Fish Cakes), Gai Pad Med Ma-Muang (Stir fried Chicken with Cashews), Tom Yum Goong (Hot and Sour Prawn Soup), and Khao Neaw Ma-Muang (Coconut Sticky Rice with Mango). 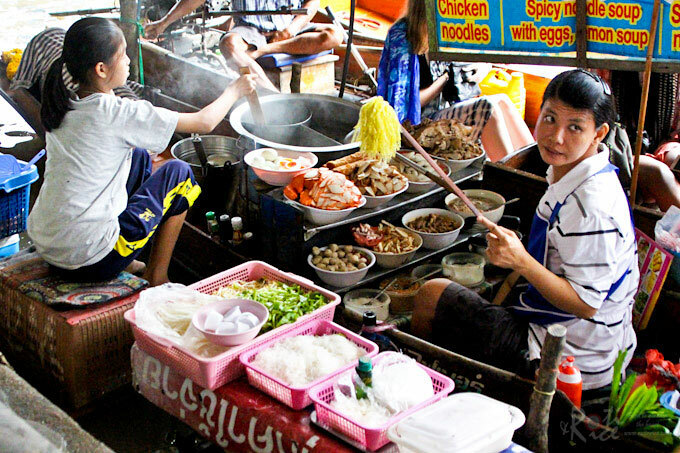 After which, we walked to the local market so that he could show me the ingredients used in Thai cooking. 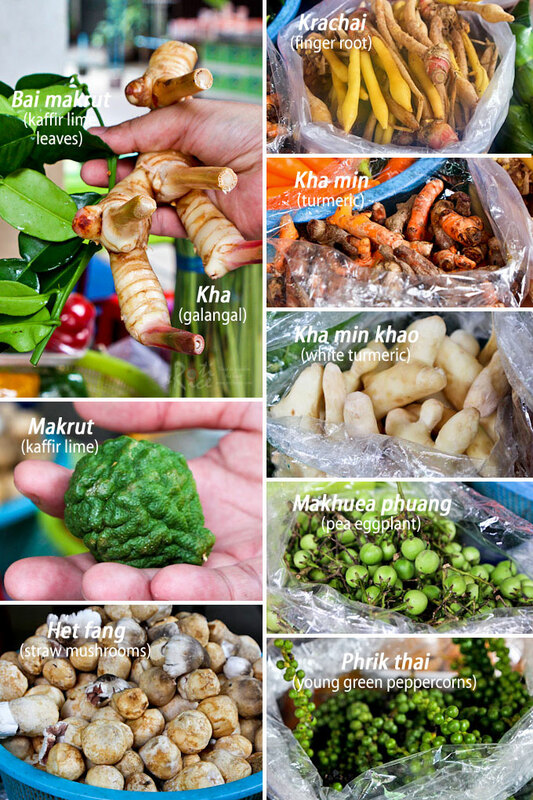 Some things are already familiar to me as they are also used in Malaysian cuisine, but some are unique to the Thais. Up until now, I have never seen finger root nor known of the existence of white turmeric. I learn something new every day. We also went to a shop selling tofu, noodles, coconut, and premix curry paste. I remember similar shops in my childhood where freshly ground curry paste were sold by Indian vendors. Not sure if those kinds of shops still exist in Malaysia today. After the interesting market tour, we headed back to the culinary school just across the street. It was a slow day and I was the only student who went for the market tour. At the school, I was joined by another student who spoke only Thai. It was getting warm but fortunately for me, the classroom has air-conditioning which was really nice…phew! The first thing we did was to steam the glutinous rice for the Khao Neaw Ma-Muang (Coconut Sticky Rice with Mango) in that conical bamboo basket and aluminum pot. Then it was time for me to work on the curry paste for my panang curry. They laid out all the ingredients I needed for the 4 dishes at my work station together with a pestle and mortar for pounding the spices. No short cuts here and certainly no blender or food processor in sight for me to use. I pounded the spices with gusto since I already have lots of practice making my Sambal Belacan. I even wrung shredded coconut to extract milk for my panang curry and coconut sticky rice. The last time I did this was a long, long time ago. It was good fun though and I really enjoyed it. I also shaped the patties for my fish cakes. As soon as I was done with the preparation work, I moved to my cooking station. 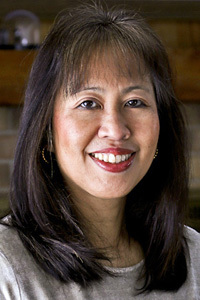 By then, the glutinous rice was fully cooked. I boiled the coconut milk with some palm sugar, pandan leaves, and a pinch of salt. After which, I poured it over the steamed glutinous rice. It seemed a little wet at first but the rice eventually soaked up all the sauce. Dessert was ready! 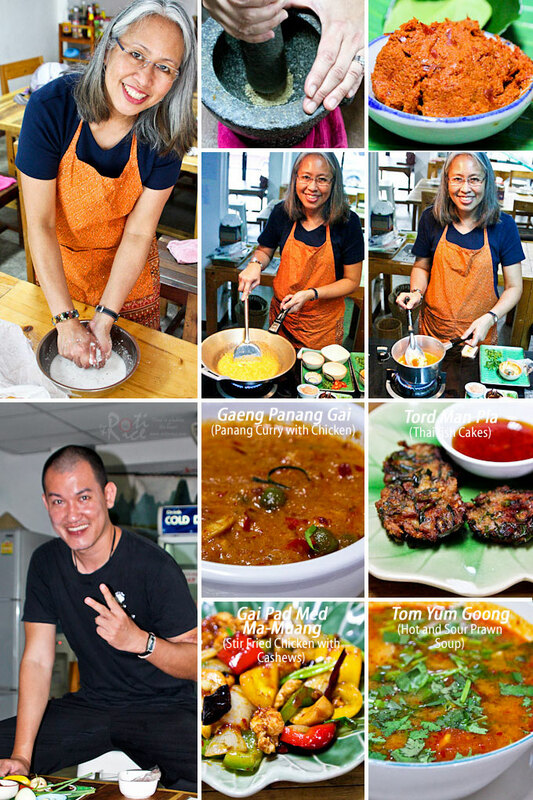 Next, I cooked the Gaeng Panang Gai, followed by the Tom Yum Goong. Then, I did the stir fry, Gai Pad Med Ma-Muang. As for the fish cakes, a helper deep fried them for me. Finally, it was chow time! I ate all I could except for the sticky rice dessert. I brought that back to the hotel to share with Ro-Ri San. 🙂 Every dish was delicious! I worked hard and needed a traditional Thai massage that afternoon to ease those sore muscles from pounding the spice paste…haha! 😉 The 2 hour long massage was painful yet therapeutic. I felt that I was being folded like origami along crease lines that I did not know existed on my body. It was almost funny at times. Glad I was able to walk back to the hotel at the end of it. After a shower, it was again dinner time. Ro Ri San and I strolled over to Cabbages and Condoms (that was the name of the restaurant – no kidding!!) for a lighter dinner this time. We ordered 3 dishes – Miang Kham (Thai Betel Leaves Salad), a fried pork with garlic, and a soup. 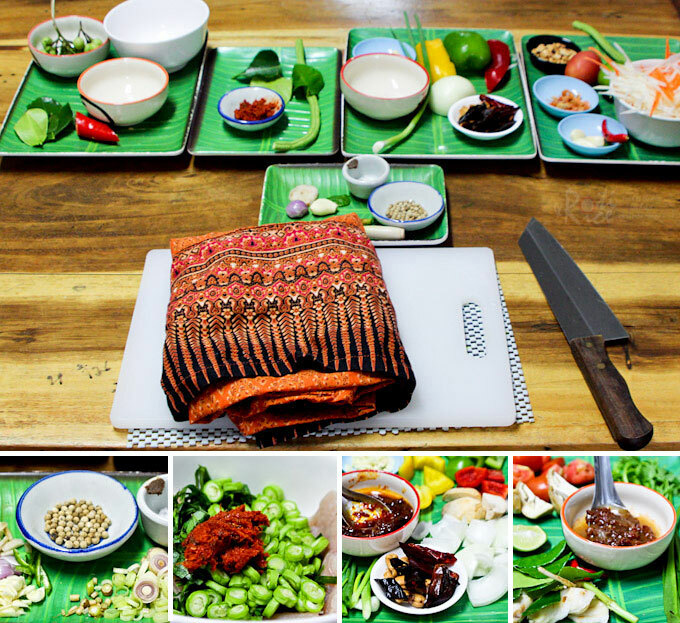 My first time eating Miang Kham and I found it be quite delicious and refreshing. I like it with tiny bits of bird’s eye chili for a little “kick”. 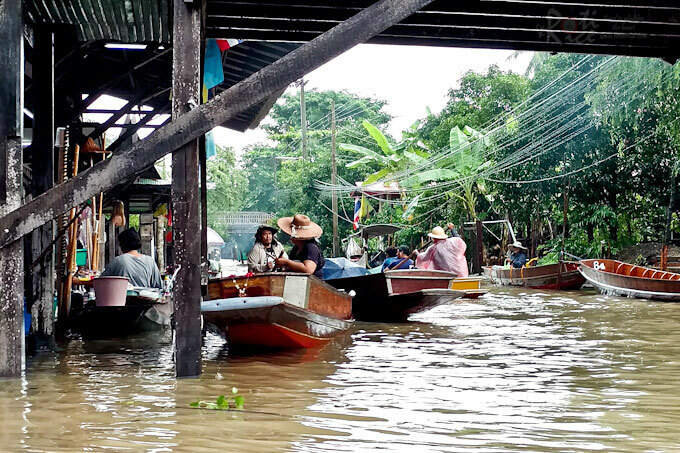 After dinner it was time for me to retire as I had arranged an early morning visit to the Damnoen Saduak Floating Market. Unfortunately, it had rained all night right through to the morning. Even so, I was not informed of a cancellation which means the tour will go on. The buffet breakfast at the hotel packed some muffins and pastries into a brown bag for me to eat on-the-go. We arrived at a coconut plantation at Samut Songkhram after more than 2 hours on the road for a brief coffee break and restroom stop. We also got to watch the locals making coconut sugar. I picked up a bag of the coconut sugar so that I can use it in my Thai dishes back home here in the US. While we were milling around, it actually stopped raining. 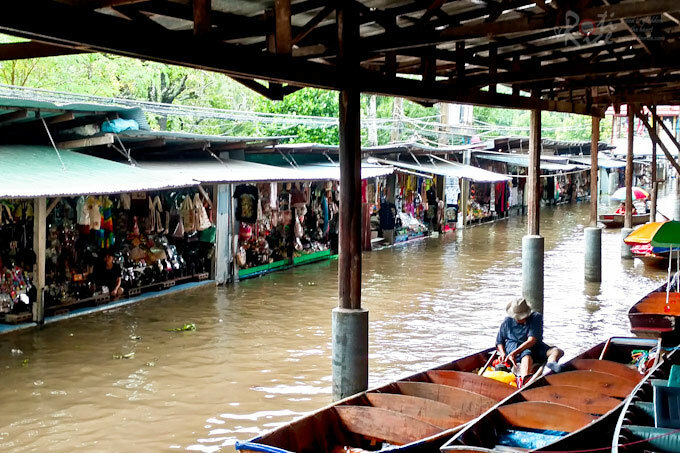 Alas, the reprieve was short lived as it started to pour again when we arrived at the first pier to catch the speedboat to the floating market. To stay dry, many of us had to purchase plastic rain ponchos at the pier. I chose a pink poncho that protected me somewhat, throughout the downpour. Perhaps it wasn’t the best idea to take the front seat on the boat but I did not really have a choice. I was hastily ushered into the seat before the boat sped off into the wilderness with rain pelting on my face. We were not asked to put on life jackets and so it felt a little scary and adventurous all at the same time. It seemed like a long ride and my mind started to wander. I thought of crocodiles and all kinds of creatures lurking in those murky waters. To distract my thoughts, I clung onto my camera and concentrated on taking pictures in the rain. 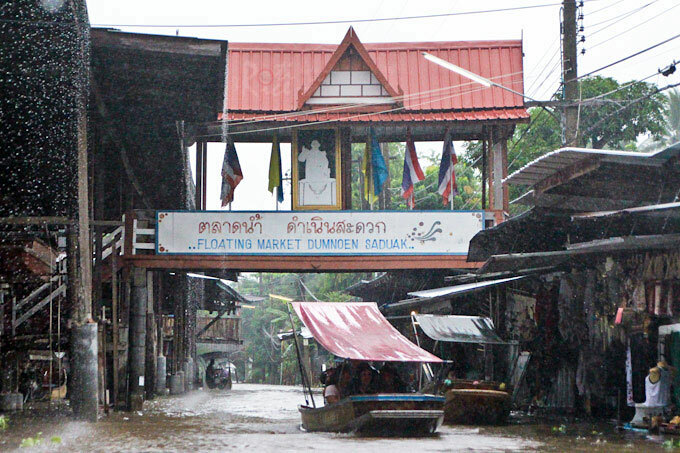 I was relieved when I finally saw the entrance to the floating market. The speedboat stopped at the crowded Charoen Sukko Pier where we alighted. The water had risen above the steps because of the rain and it was a mess getting off. Thankfully, I managed to get onto the pier in two huge hops. Good thing my shoes are water resistant! 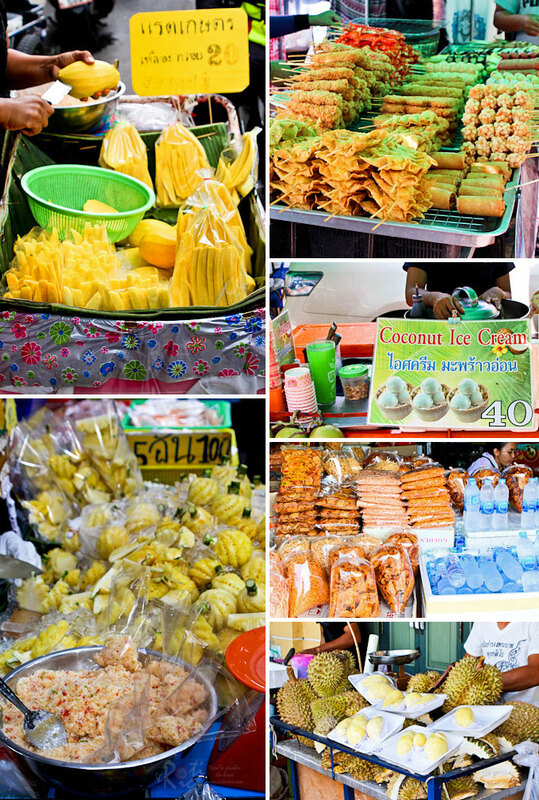 Most of the stalls were selling souvenirs. 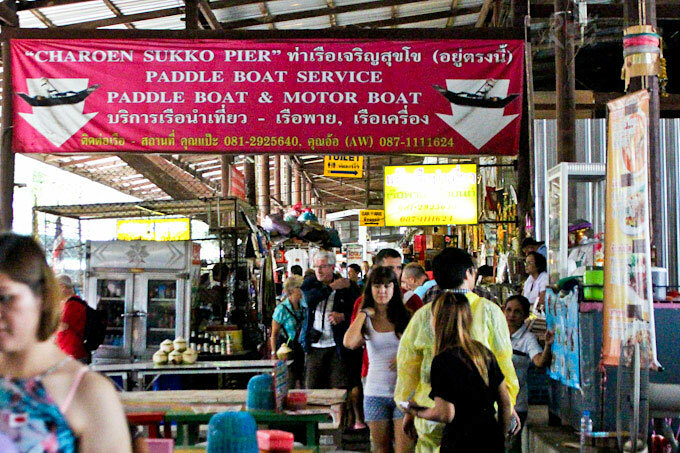 Our boat would stop at a stall if someone signaled that they were interested to buy something. Otherwise, the boat continued to cruise along the route which took about 20 minutes to complete. I did not see any boats selling produce or food until we got back to the pier. 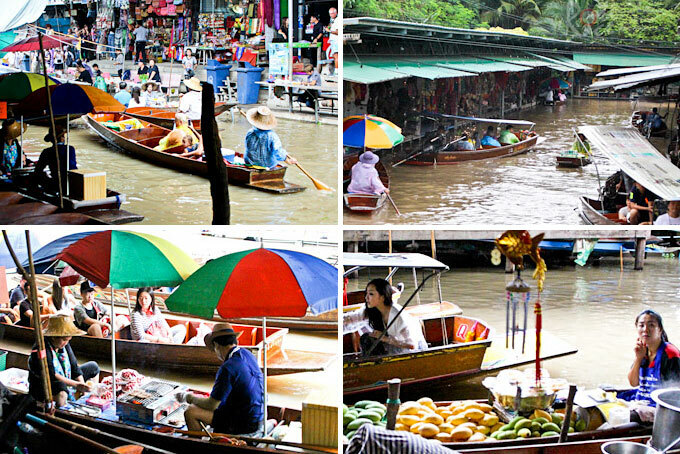 By then the rain had stopped and the food sellers in boats suddenly appeared. The tourists (myself included) got really excited because it was quite a sight and a great photo opportunity. This one boat selling chicken noodle soup must have been the most photographed boat of the hour. All that photo taking made me hungry and so I sat down for a serving of Pad Thai and fresh coconut which cost a total of 280 bahts, about USD8.00. After lunch it was time for us to head back to Bangkok before the evening rush hour. For dinner that evening we ate Korean food at the Korean quarter just opposite the street from our hotel. We had all kinds of grilled meats and tiny side dishes but I was too tired to take any pictures. The next day, my Thonburi Klongs and Grand Palace tour was canceled due to the passing of the Thai King. 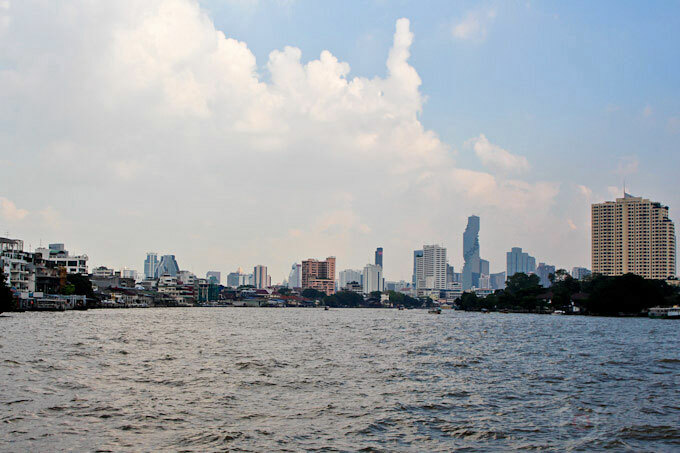 I had to change plans and so I took the Skytrain to the Saphan Taksin station to catch the Chao Phraya Tourist Boat, a hop on and off river boat plying the right bank of the Chao Phraya river. 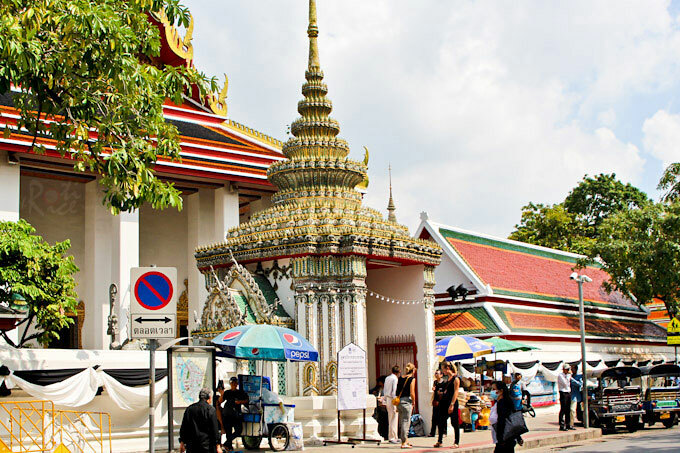 The eight stops gave access to Bangkok’s most famous tourist attractions including the Grand Palace area. I spent the entire day hopping from pier to pier and attraction to attraction. It was most convenient and I highly recommend taking this tourist boat. 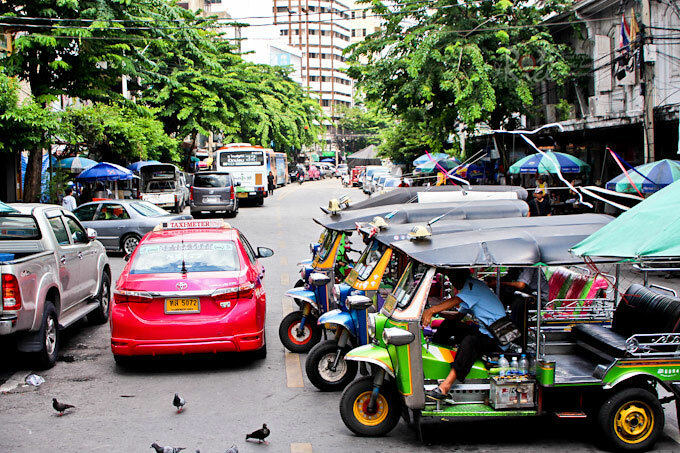 My first stop was at Ratchawonse where I walked a short distance to the immense Chinatown which stretched over several parallel streets. 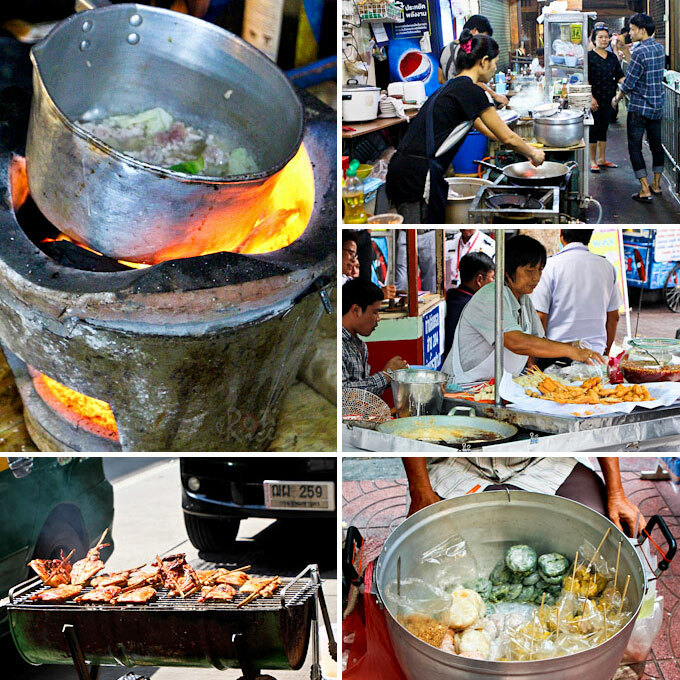 … as well as at Tha Tien. 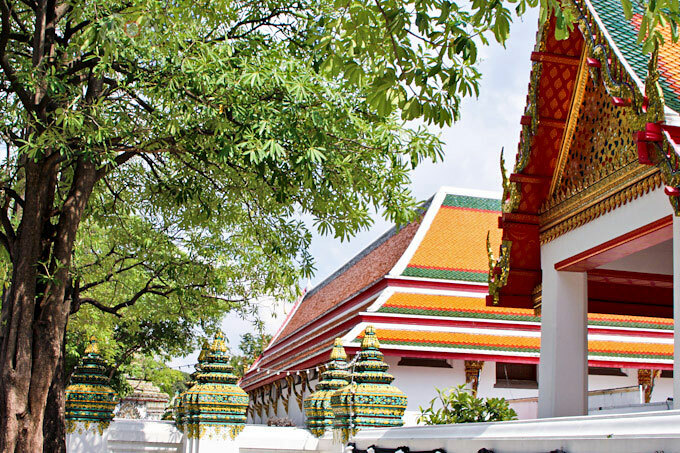 I also took the opportunity to take pictures of one of Thailand’s most renown temples, Wat Pho. I also made a stop at Tha Maharaj to hopefully catch a glimpse of the Grand Palace which was closed at the time I was there. The street leading to the palace gate were lined on one side with chairs for the Thai people mourning the demise of their beloved King Bhumibol Adulyadej. Cakes and drinks were served to the mourners. 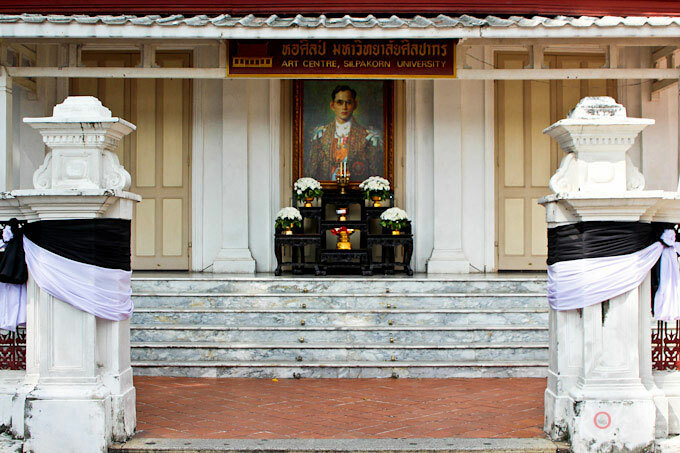 The picture below was taken at the entrance of Silpakorn University just beside the Grand Palace. 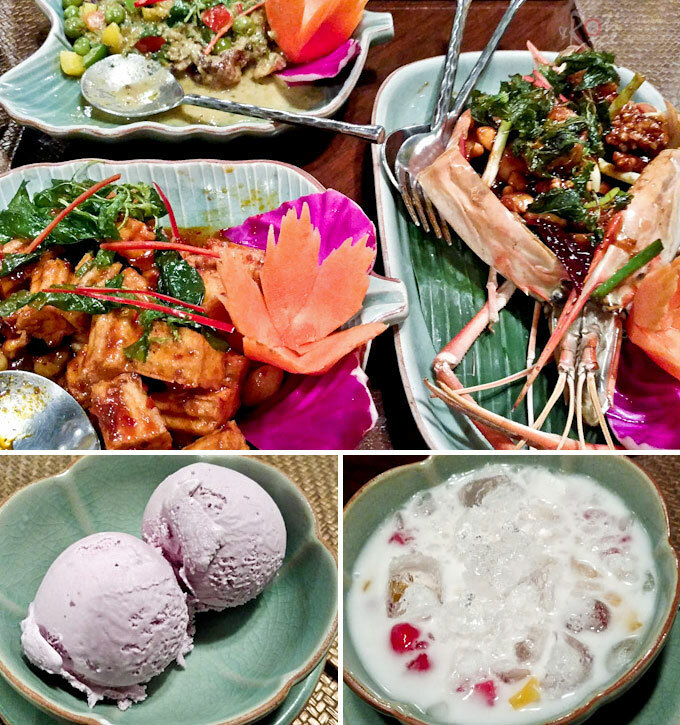 Back in Sukhumvit that evening, we enjoyed another sumptuous classic Thai dinner at Baan Khanitha. The interior is charming and the food delicious. It was a short but interesting sojourn in Thailand, the Land of Smiles. Please join me in Singapore on the next leg of my travel in Asia. Wow, I am so envious that you managed to put in cookery lessons too. What is the white turmeric used for? Everything is so interesting. Thank you for sharing, Linda! That cooking class was a lot of fun. From now on I will try to arrange cooking classes where possible on my foreign visits. 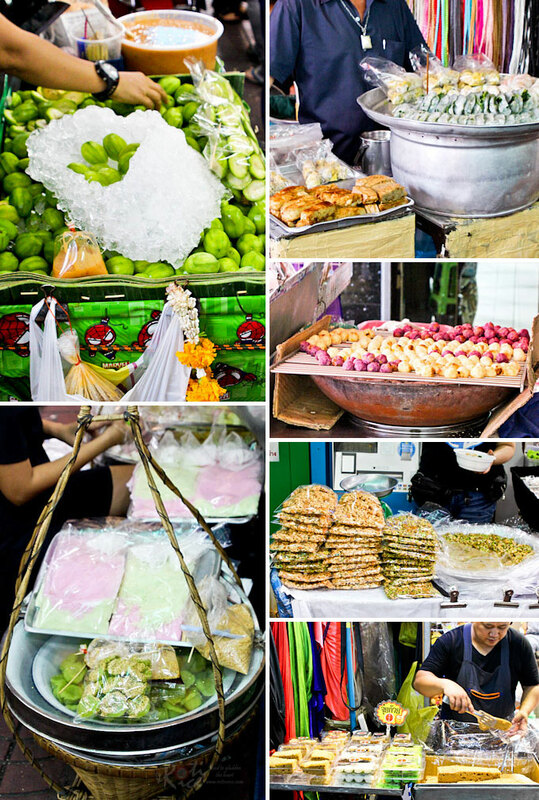 Always enjoy going to the markets and being able to use the ingredients is even better. White turmeric is like ginger. We did not use it in the class and so I am not sure what the Thais may use it for. I think it will be good in curries.